Do please excuse me for not being around much recently. You will, however, thank me when you know why. We're busily, but unphotogenically, beetling our way through January. Quite happily I might add. Aside from the normal routine of school runs and chores, I'm decorating the hall, stairs and landings. We live in a three storey house so it's no small job. I think I've told you before, I'm quite a slow and careful painter. You know those television programmes where a crew of thirty people swoop in on some poor unsuspecting person's home, slap on various hideous shades of emulsion, and exit twenty minutes later declaring the house entirely made over? Well, they are my worst nightmare. I've told my children that I will run naked across their school playing fields if they ever surprise me with anything like that. D's threat is different but I'm afraid I can't share it with you. I've also just bought a steam cleaner. What a revelation that is! I'm hosing crevices like a mad thing and, rather worringly, seem to have roused some obsessive compulsive tendencies I didn't realise I had. It would seem that very few people share my excitement when it comes to restoring the colour of grout! My Mum came for a cup of tea. "I'm feeling a bit Januaryish. Make me laugh." she said. So, you see, I'm a bit of a dullard at the moment. Other than a little cross stitch here and there, my recent doings don't make for good reading, blogwise. Or any wise. Still, I figure that, of the twelve, January is probably the best month to be boring. PS. Lovely cross stitch chart free here. PPS. Thank you sooo much for your lovely comments on my posy cosy. Lovely little cross stitch ..... I've pinned it for a rainy day! That's what January is for! Sorting cupboards; steaming grout; painting baseboards - totally boring but I would not want to do this in any other month. I have come to realize that January is like a lovely, quiet gift that gets your soul and mind back in order. Was wondering where you were ! I totally agree about those makeover programmes - fun to watch, but don't EVER do it to my house !!! Imagine finding all your treasured 'rubbish' in a skip on your driveway !! Love the little cross stitch! Feeling 'Januaryish'...that about sums it up!! I am with you on the tv makeover shows, my worst nightmare too, how on earth can they make over a house that quickly, and yip, the emulsion is always hideous! I have to get a steam cleaner, I have heard so many marvellous things about them! January is a wonderful month. I'm doing similar things here, and I'm decluttering a bit too much. I've thrown away important pieces of paper yesterday and the day before. I've had to go through the bin and stick them back together. Good luck with the decorating, I'm sure it will be perfect when it's done. PS - The cross stitch is adorable! That little cross stitch pattern is absolutely gorgeous. I love how she has crocheted the edges....so so cute! Have a lovely Sunday. I can't believe how fast January has gone... Next week is February already!! Getting grouting back to its original colour is NOT boring. If I could do it, I would be THRILLED BEYOND COMPARE! I'd have quite enjoyed some "before and after" cleaning posts, to be honest! :-P Still, enjoy your cleaning and crafting adventures, photoless as they may be! Oh, that steam cleaner does sound rather tempting, I was thinking about getting one last year, purely for its ability to sort out grouting.......I might well go ahead now based on reading this! Can I be very sad and ask which make/model you bought as I know some of them don't do the job properly, and you sound well pleased with yours! Lovely little cross stitch Heather. Good luck with the decorating! Hope your decorating is going well! 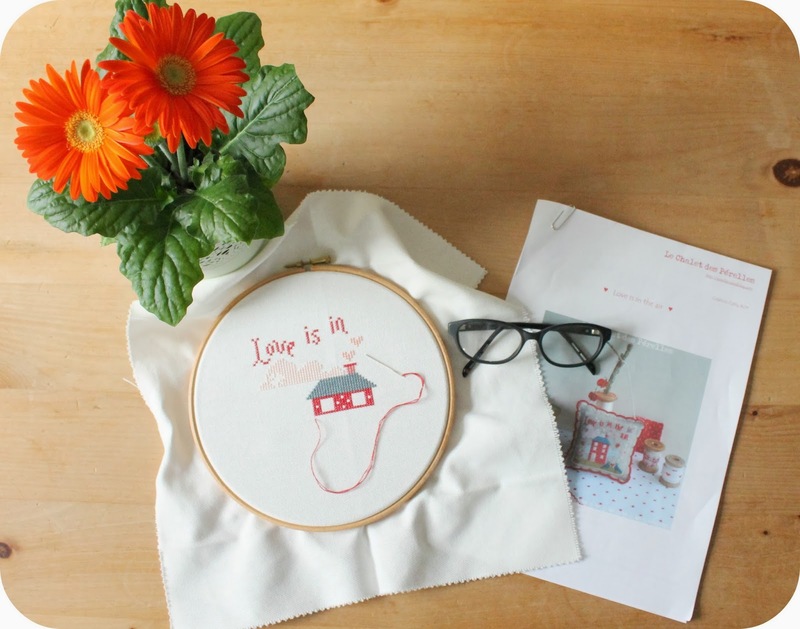 Love your sweet little cross stitch.....you are a very neat stitcher, Heather! Oh I don't like those one hour makeover shows at all, better to take your time and do the job properly! Love that wee cross stitch and thank you for sharing the link to the chart...I am off now to download it. I've been looking at steam cleaners and haven't been able to make up my mind but I might go for it now that you've had so much success with yours. Lovely cross-stitch, thanks for sharing the link to the chart. Have a good week. I seem to have lost January, and I don't have a redecorated house to show for it. So go you! You are never boring here by the way, however Januaryish you may feel. Steam cleaners do not sound boring in the slightest. (I could get into those given the chance) And you are NOT a dullard. Infact you've made me chuckle simply by reading your post. Have fun with the slow and methodical painting! You had me hooked once you mentioned the steam cleaner! Made me giggle this, love meeting other secret ocd'ers. As January's go this has been our most exciting ever 2014 is looking good.